So the 5th Annual Solo Pottery Show was a success and Dave helped with both days, was very pleasant to the customers and packed every tub back into the car once I had carefully packed each pot into the wrapping. A lot of my regular customers came and bought christmas presents and such for the holidays. A few cute people were VERY sneaky, asking Dave and I to set aside a group of pots for them to come to the house and pick up later when their spouse wouldn't know and one from Victoria whose wife described the perfect mug for her hand and then I went and got it for her from the mass of mugs, to the astonishment of the group only to have them put it back and leave with a different pot, the husband emailed later and asked that I put the mug aside (luckily I still had it) and we will meet somewhere or I will mail it to them. Sigh, how sweet. I went through my costs for this year and was happy to see that getting rid of the POS machine used for processing debit cards saved me a LOT of money and the fact that the new tax system has dropped my little business also meant less cost for the second half of this year. Not so much if you sell food in a restaurant as the tax increase is a few dollars on each meal out. I realized today that if things stay relatively stable in the shows that I do and the amount of pots that I make, I am going to be able to continue potting. The studio rent (heat/lights/kiln costs) is paid for along with all the clay, glazes and supplies that I use and there is a little bit for wool and material for new clothes and a little money in case the kiln melts down or I need some unforeseen thing to keep potting. I save a lot of money with the cycling and trailer, it also earns me a lot of respect around here in a place that rains more than it doesn't. I show up at Farmer's Market meeting dripping and wearing rubber pants with booties over my shoes, a toque and I have to blow my nose at least twice at the start of each meeting but they are all used to the bike attire and simply ignore it now. I also show up to adjudicate the new vendors who would like to join and get a few looks as though I don't belong but that soon ends when we are introduced. If I am running a TINY business that is holding it's own in this world of 'dual-income-mortgage-payments' what does that mean for my life. Is it possible to do this? To really do this? Without charity, or pity or craziness but for real?! I was once again really humbled by the show and thought it was very cute that one of my regular customers husband and kid came in and asked if I could recall what the wife had wanted while taking into account what they had already bought in the summer for her. Of course I knew what she had wanted! The youngster paid for half of the mug and I gave them the regular customer discount on the other pieces and was warmed spiritually by the interaction. I came home, vacuumed the gallery shelves, did a lot of laundry and tidied everything and then unpacked all 15 tubs and found the best spots for each family of pots. I have been building shelves of all different heights and widths and a pot should look like it fits the shelf not be drowned by empty space around it or crowded by its cousins. I tidied the throwing studio today too and washed the floor again as it must be kept perfectly clean so that we don't fill up with silica and drown in our own lung guck. Now, sitting on the couch at the end of the day, with a warm mug (too flawed to sell but not too badly to love) the rain pelting the house so loudly it interrupts conversation, and I am thinking that maybe, just maybe , on some level I am exactly where I am meant to be, doing exactly what I was meant to do. People always joke that the two oldest occupations are... well if you don't know the saying never mind... and being a lawyer and I was going to offer a third one to add to the list. 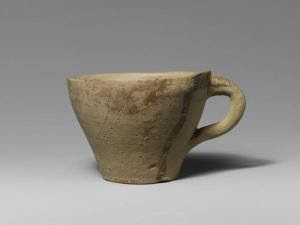 I found a blog post today that had a photo of a mug that was made in 1400BC. I have borrowed the photo and put it at the top so you can decide for yourselves about the occupations of the past. Maybe if the earliest people were able to make sweet little pots for other people and survive then maybe so can I. Well, off to bed then back to work in the morning...maybe I'll make a nice little bowl with steep sides and a round "hara" and the perfect spout for pouring pancake batter or an omelet from... or maybe I'll make a dozen of them! Thank you to everyone who came to the show and to Barbara Sobon who helped so much with the staging of the display and wonderful Dave who works for me for two days every year without a single complaint and all for a nice dinner and a cup of Coffee on the Moon coffee!